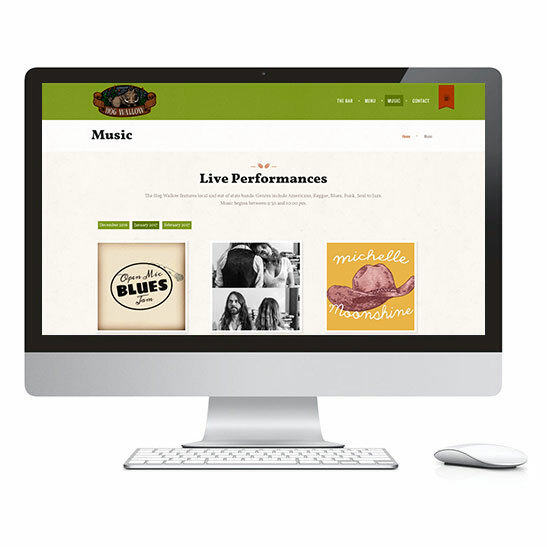 Clever, customized upgrades make this responsive website for a popular Salt Lake City watering hole and live music venue one of the classics. A local pub’s musical performance calendar automatically displays upcoming shows without a CMS. This is one of my favorite projects of all time because of it’s beautiful simplicity. 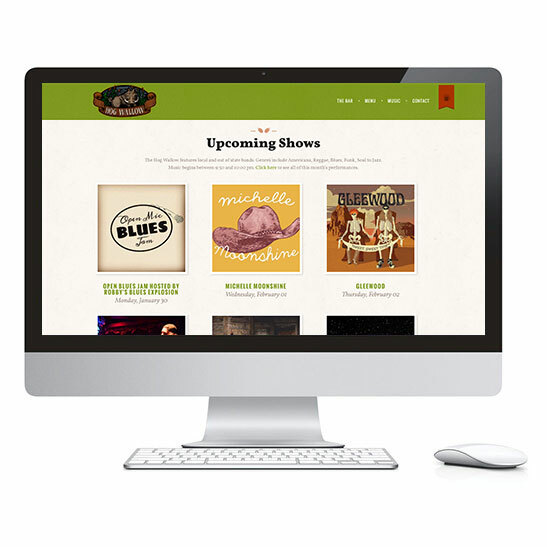 The Hog Wallow’s event manager contacted Pixelcrane because he wanted a no-frills, up-to-date website and easy-to-manage music calendar. The client had some web development experience of his own and wanted to utilize an MS Access database he created and maintained in order to keep track of the live performances at his bar. He had everything very well organized from the start. Normally, I use WordPress for data-driven sites. But this time the client just wanted to use an inexpensive, responsive HTML5 template he found and have me brand it. No problem. The fun stuff is the functionality for how upcoming/current performances are shown throughout the site. On the home page, the current day’s performer (Band A) is automatically displayed in the first position of a 3 x 3 dynamic grid (with Band B, Band C, etc. ), the until midnight of the actual performance date. Then at midnight, the previous day’s performer information falls off the grid and everything shifts to the left. On the ‘Music’ page, there are 3 tabs/links which display automatically display: previousMonth allPerformers, currentMonth allPerformers, nextMonth allPerformers. I even created a PSD template the event manager uses to create his own images for a band’s profile picture. There are also hooks for a performer’s social media links and bio to be displayed on a detail page. I help people tell their stories though websites and print.